Kings, The Books of: The two books formed originally but one book in the Hebrew Scriptures. The present division into two books was first made by the LXX., which now, with the Vulgate, numbers them as the third and fourth books of Kings, the two books of Samuel being the first and second books of Kings. They contain the annals of the Jewish commonwealth from the accession of Solomon till the subjugation of the kingdom by Nebuchadnezzar and the Babylonians (apparently a period of about four hundred and fifty-three years). The books of Chronicles (which see) are more comprehensive in their contents than those of Kings. The latter synchronize with 1 Chronicles 28:1-29:30 to 2 Chronicles 1:1- 36:21. 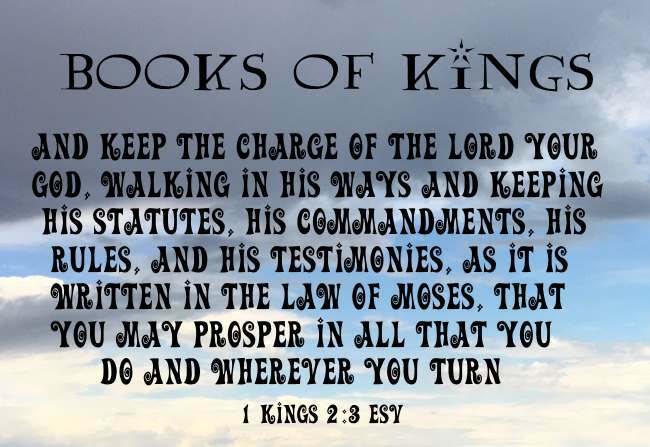 While in the Chronicles greater prominence is given to the priestly or Levitical office, in the Kings greater prominence is given to the kingly. The authorship of these books is uncertain. There are some portions of them and of Jeremiah that are almost identical, e.g., 2 Kings 24:18-25 and Jeremiah 52:1-34; 39:1-10; 40:7-41:10. There are also many undesigned coincidences between Jeremiah and Kings (2 Kings 21:1 - 23:37 and Jeremiah 7:15, 15:4, 19:3, etc. ), and events recorded in Kings of which Jeremiah had personal knowledge. These facts countenance in some degree the tradition that Jeremiah was the author of these books. But the more probable supposition is that Ezra, after the Captivity, compiled them from documents written perhaps by David, Solomon, Nathan, Gad, and Iddo, and that he arranged them in the order in which they now exist. In the threefold division of the Scriptures by the Jews, these books are ranked among the "Prophets." They are frequently quoted or alluded to by our Lord and his apostles (Matthew 6:29; 12:42; Luke 4:25,26; 10:4; comp. 2 Kings 4:29; Mark 1:6; comp. 2 Kings 1:8; Matthew 3:4, etc.). the "book of the chronicles of the kings of Israel" (1 Kings 14:19; 15:31; 16:14,20,27, etc.). The date of its composition was sometime between B.C. 561, the date of the last chapter (2 Kings 25:1-30), when Jehoiachin was released from captivity by Evil-merodach, and B.C. 538, the date of the decree of deliverance by Cyrus.